Quform WordPress v2 DocumentationFAQFormsHow do I make Quform forms compliant with GDPR? To make the forms compliant with the EU GDPR, choose one of the solutions below. Please note that we are not lawyers, so it would be best to consult with one. For reference, see the ICO’s Guide to the GDPR. For each form, go to Edit Form → Settings → General and turn off the option Save submitted form data. 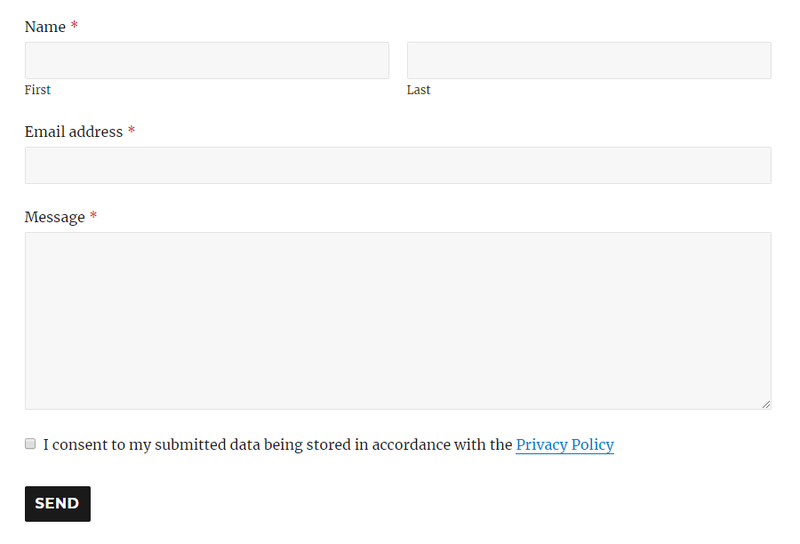 No data will be stored from form submissions, but you will still be able to manage submissions via email. Note that email is not always 100% reliable, particularly if using the default WordPress settings. To improve email sending reliability, we recommend using a WordPress SMTP plugin for sending email, such as WP Mail SMTP. 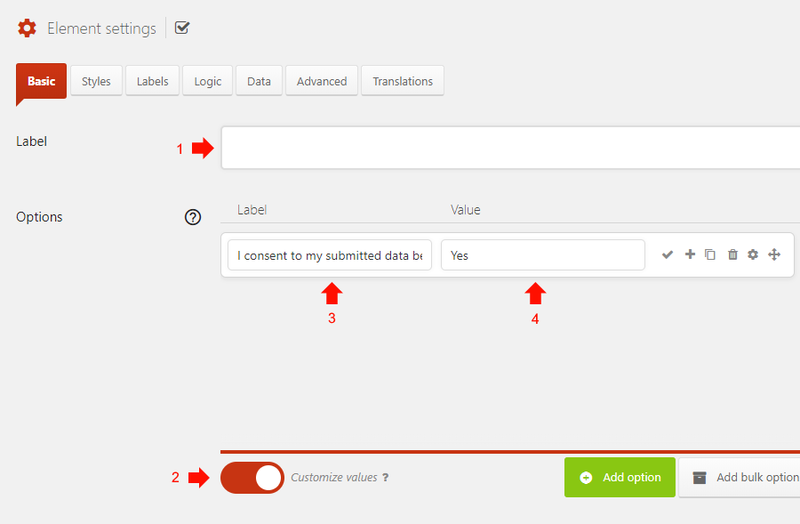 Add a Checkbox element to the form, to require consent for storing the user’s data as part of the form submission process. See the image below for an example. Expand the toggle below for how to configure this element for positive opt-in consent required by the GDPR. In the Checkbox element settings on the Basic tab set the following options. On the Labels tab set the Admin label field to text to help you identify this element (it will not be shown to the user). For reference, see Right of access | ICO. The regulations state that you have one month to respond to a Right of access request. If you decide to comply with this request, in Quform you can gather data stored about a user by going to Forms → Entries, then searching for the user data (for example enter the user’s email address in the entries search box). For each found entry that applies to the user, View the individual entry then print the page (Ctrl + P) and choose Destination… Save as PDF. Switch to the next form and repeat this search for every form. Send the saved PDF files to the user. For reference, see Right to rectification | ICO. The regulations state that you have one month to respond to a Right to rectification request. If you decide to comply with this request, in Quform you can find the stored by a user by going to Forms → Entries, then searching for the user data (for example enter the user’s email address in the entries search box). For each found entry that applies to the user, Edit the individual entry and make the necessary modifications then click Save. Switch to the next form and repeat this search for every form. For reference, see Right to erasure | ICO. The regulations state that you have one month to respond to a Right to erasure request. If you decide to comply with this request, in Quform you can find the stored by a user by going to Forms → Entries, then searching for the user data (for example enter the user’s email address in the entries search box). For each found entry that applies to the user, Trash the individual entry. Once each entry is in the Trash go to the Trash view and select all entries then permanently delete them. Switch to the next form and repeat this search for every form.